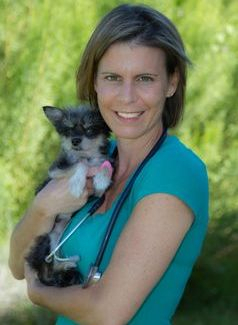 Dr. Stephanie Webb has 17 years of experience in small animal medicine, including 10 years practicing in Georgetown and 6 years practicing in Canyon Lake, Texas. Dr. Webb graduated from the University of Texas at Austin with a bachelor of science in biology. She earned her doctorate in veterinary medicine from Texas A & M University, where she graduated with honors. Dr. Webb believes that keeping your pet healthy dramatically improves their quality of life. Her special interests include internal medicine, surgery, and dentistry. In addition, Dr. Webb is one of the few veterinarians in Georgetown who is highly skilled in ultrasonography, with over 12 years of experience in diagnostic imaging. Ultrasound enables Dr. Webb to evaluate and diagnose soft tissue abnormalities that might otherwise be missed by x-ray. Dr. Webb is married with two elementary-aged children, 2 cats, and 2 dogs. They all keep her very busy. She looks forward to meeting you and your family members as well! Why Good Water Animal Hospital? At Good Water Animal Hospital, we are focused on providing veterinary services with the highest levels of client satisfaction – we will do everything we can to provide quality care for you and your pets. Please visit our client testimonials page for more information on the quality of care you can expect from our dedicated and professional staff. "I have known Dr. Webb for quite some time. She is excellent and very professional. I take all my pets to her and she treats them as if they were her own. Her staff is kind and g..."
"I adpoted my daughters cat when she moved out of our house, last week she was having problems straining to urinate over the weekend. I took her in first thing monday morning Dr..."
Excellent Care by a fantastic Dr.
"My dogs are difficult at best when visiting the Vet. When I observed the way they interacted with Dr. Webb I was astounded. She has been very understanding of my particular si..."